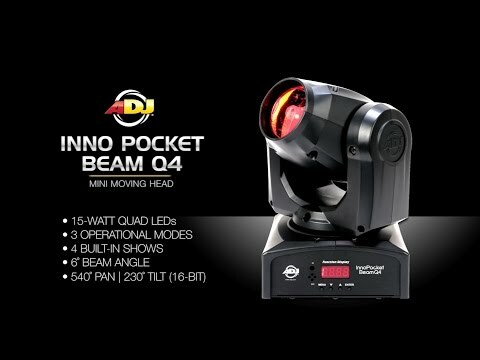 The Inno Pocket Beam Q4 is a mini Moving Head beam effect with a bright 15-Watt Quad LED source. Its compact size and lightweight makes it ideal for mobile entertainers, small club and bars, roller rinks, bowling centers or any mobile production. Featuring a RGBW quad color LED, the Inno Pocket Beam Q4 will give pure lighting excitement with its 4built-in shows, fast moving beams and color changes. For added excitement, it has a pan and tilt inversion mode that makes one head do the opposite of another when linked together. Other control methods include: Sound active with 4 built-in shows, or use a DMX controller to create your own light shows. Considering purchasing the American DJ Inno Pocket Beam Q4? Have questions? Ask people who've recently bought one. Do you own the American DJ Inno Pocket Beam Q4? Why not write a review based on your experience with it. Very well made beam moving head. Arrived beautifully packaged. Good range of channel features. Decent value for money. A really cool beam effect from ADJ. A really bright, sharp quad led which will punch well through any atmospheric effects. Very quick moving and inexpensive and would work great for any fast moving shows!! Very good!!! Seen a video for American DJ Inno Pocket Beam Q4 online or have you own video? 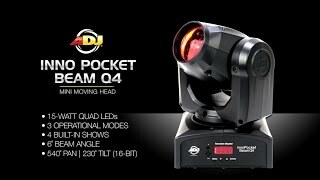 Check out American DJ Inno Pocket Beam Q4 on DJkit.com!